One fine Sunday afternoon, Judy and I were shopping at a local furniture store. 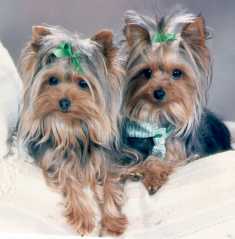 We observed a woman with a shoulder pocketbook, and sticking out of the top were these two cute and very animated yorkies. As the woman was very attractive, I approached her to inquire about the dogs and she asked if I wanted to hold one of them. Then, without any hesitation, she handed me Toby. Judy and I couldn't believe how cute and friendly these yorkies were. Our hearts told us immediately that this was the dog for us. We asked about the breeder and were given the name, address, and telephone number. This event and a call to the breeder started our adventure with Yorkies. We would like to thank MaryLou Curran for being in the store and being so nice to take the time to stop and talk to us, and to provide me with this picture.